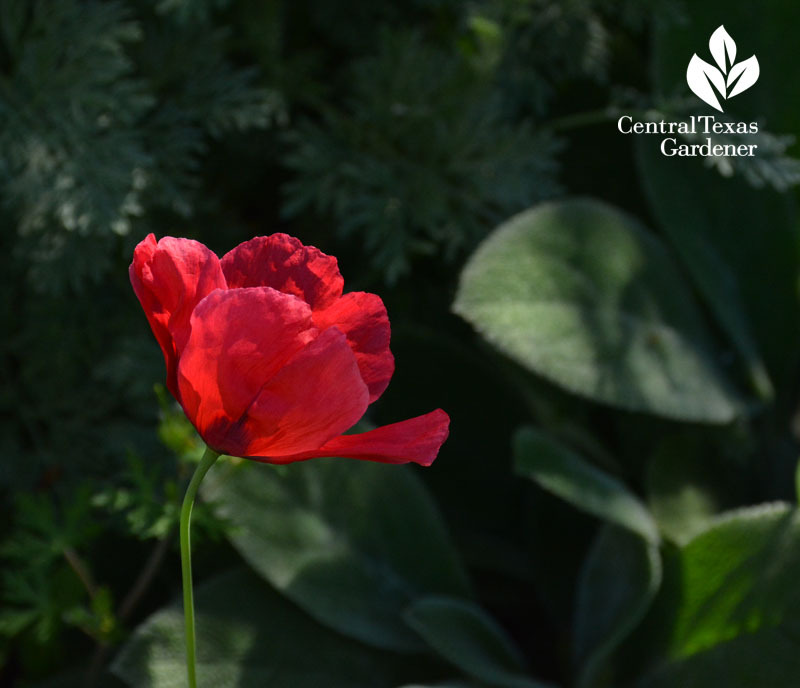 Despite only rainfall spit for months, a few poppies won’t miss their yearly applause. 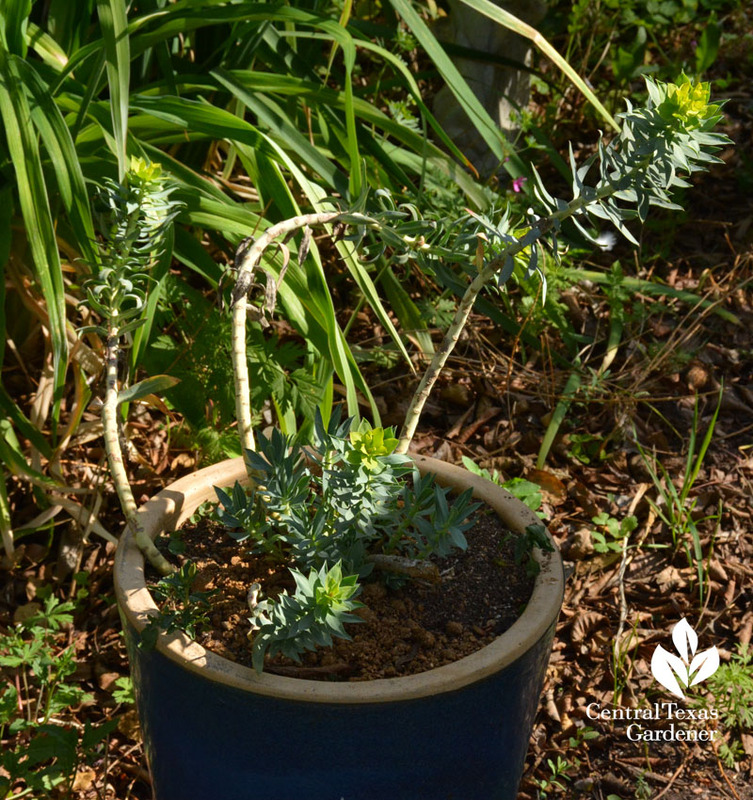 This clever one selected artemisia and lamb’s ears to show off in the crowd. 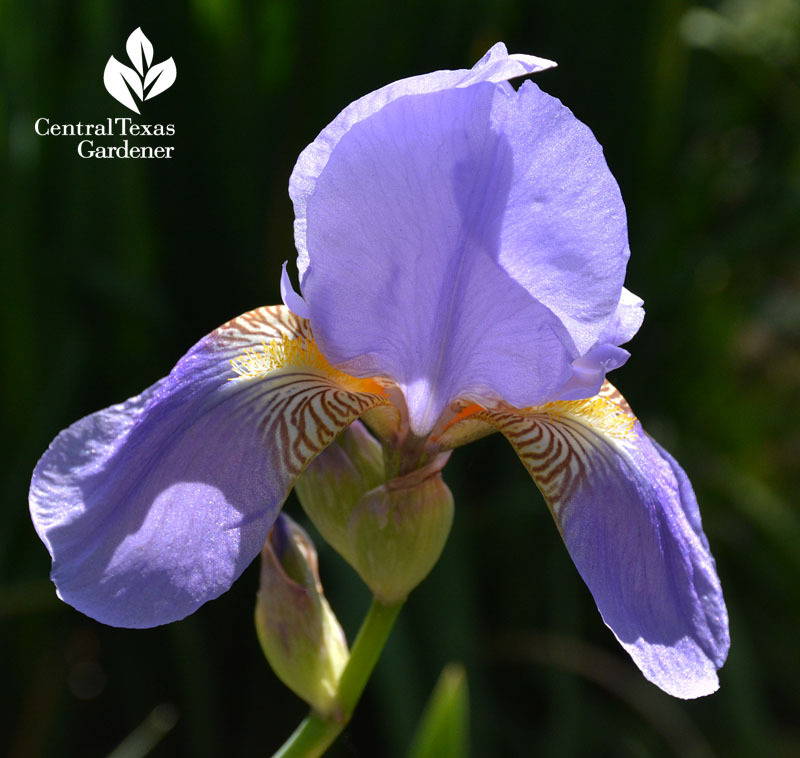 I’m a fan of drought tolerant bearded iris, even when not in bloom. 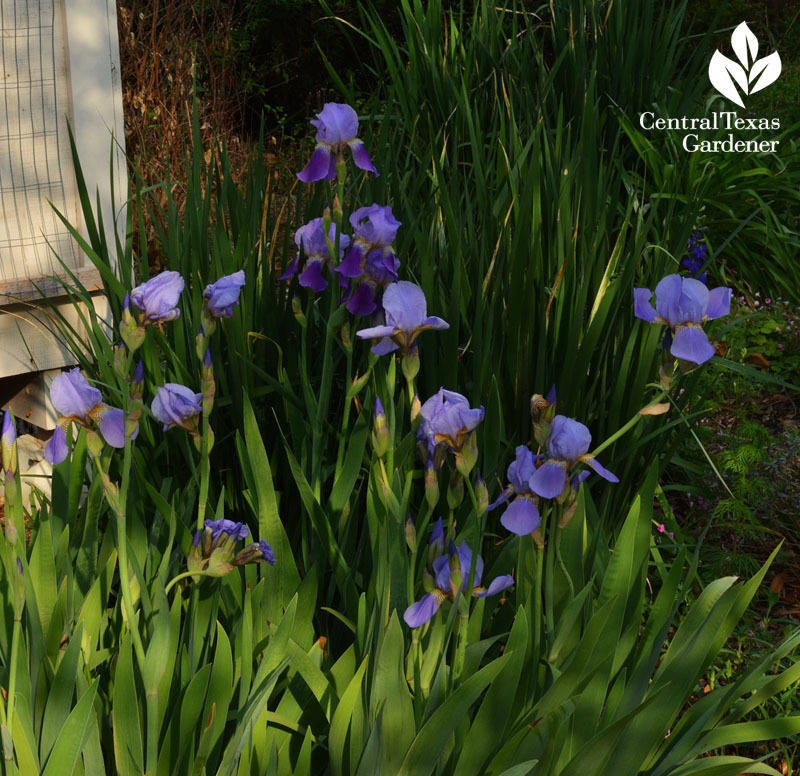 Right now, deeper green spuria irises join in this end bed’s structural anchor. They’ll tag along with golden blooms in a few weeks. 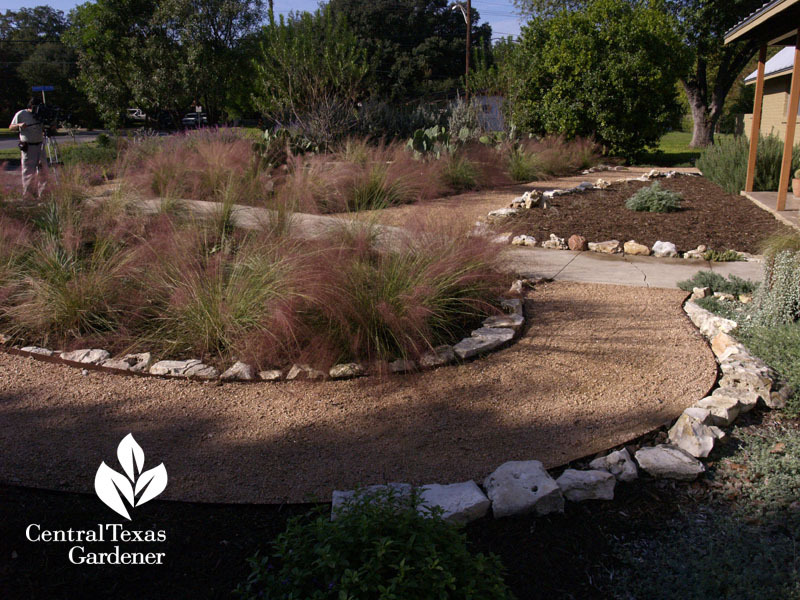 Texas bluegrass (Poa arachnifera) is in full swing with blackfoot daisy and rambunctious pink evening primrose. 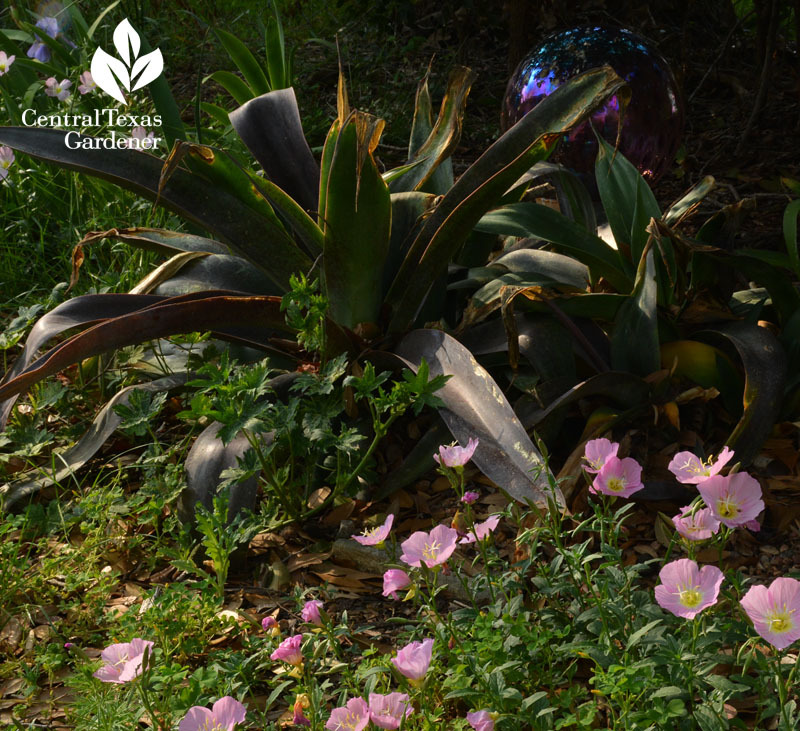 Pink evening primrose picked its own spot to cheer up freeze-nipped ‘Macho Mocha’ mangave. 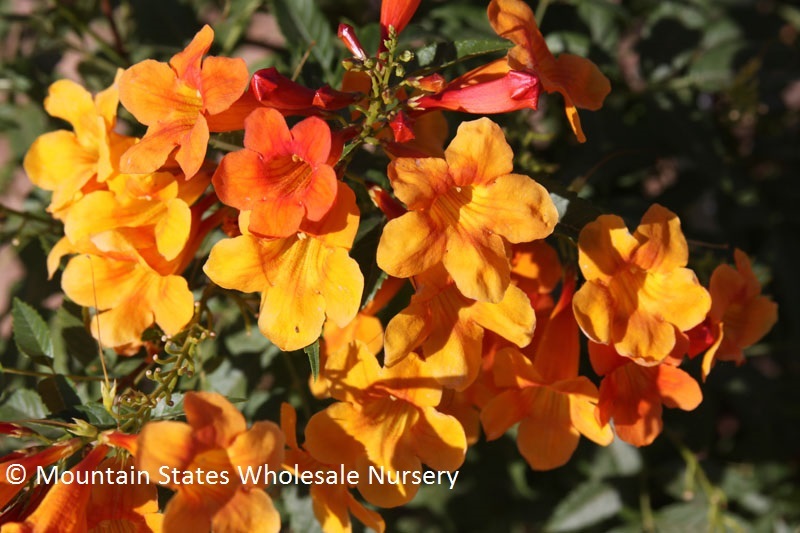 For years, I bet lots of my drought buster plants (and yours too) started at Mountain States Wholesale Nursery in Arizona—many from seeds collected right here in Texas! 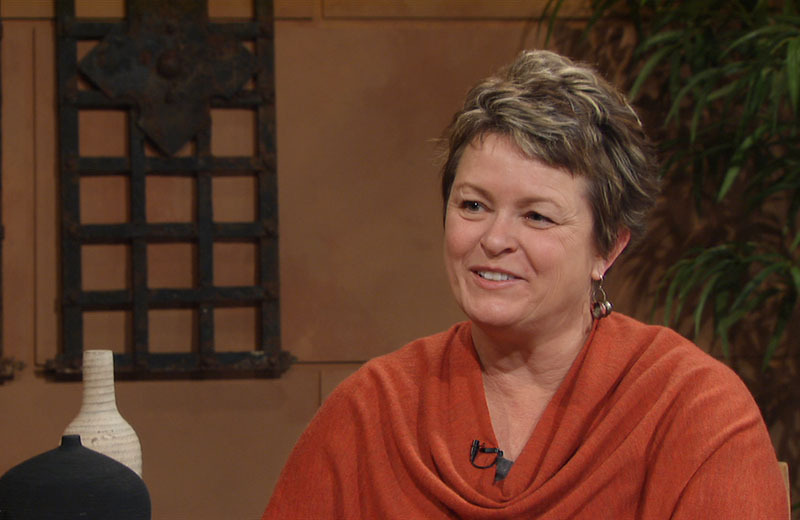 This week, Tom meets with Janet Rademacher for a few you don’t want to miss at your local nurseries. 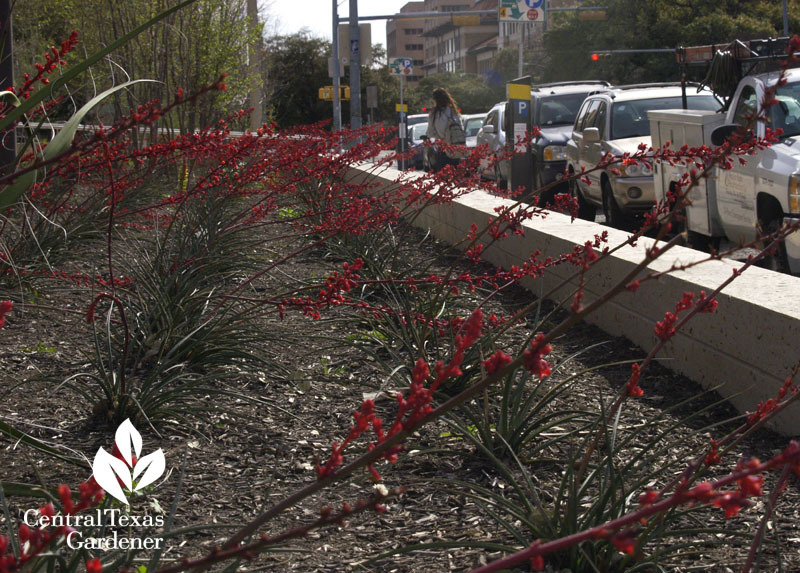 We all love red yucca, but Hesperaloe parviflora Brakelights® PPAF certainly brakes us to stop for another look! 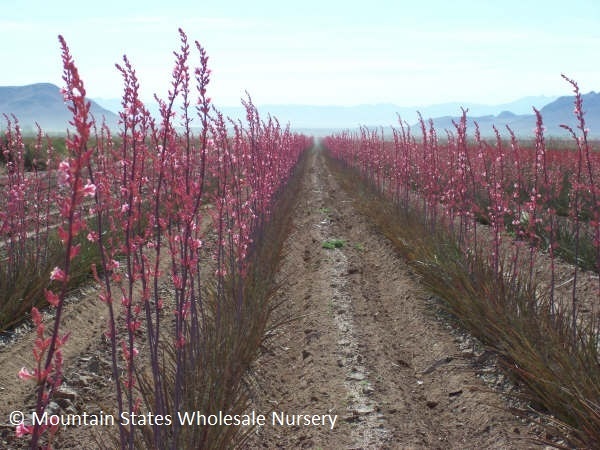 And what about Hesperaloe x Pink Parade with a more upright flower? Summer won’t seem so awful with bold Tecoma x Solar Flare to catch the rays. 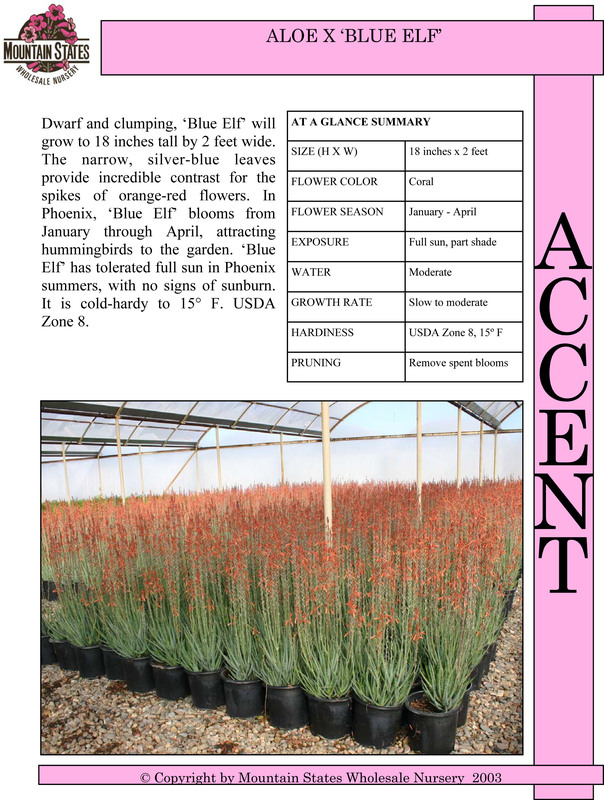 Aloe x Blue Elf is one her list I’m adding to mine. Here’s the kind of great fact sheets you can read on Mountain States’ website. 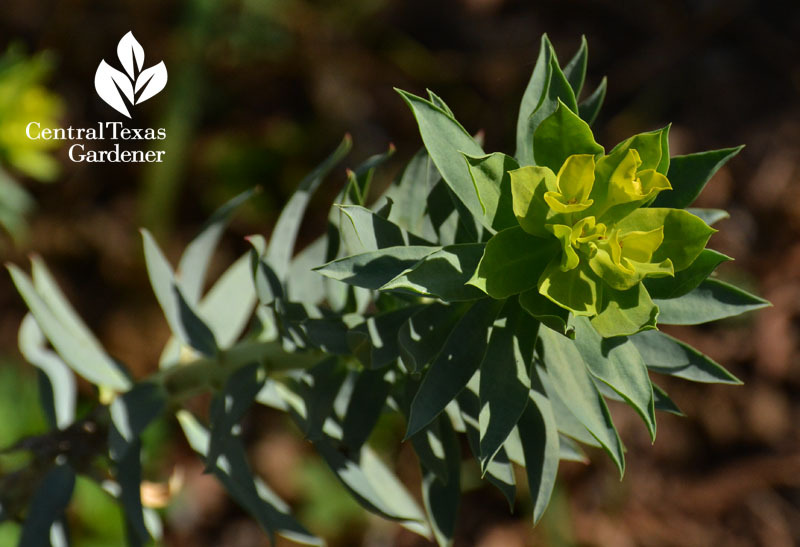 In those narrow well-drained spots with lots of sun, Candelilla Euphorbia antisyphilitica is positively soothing. Another smaller one Janet features is gopher plant (Euphorbia rigida). My very first is already blooming in its pot. I didn’t dare plant this guy in my clay soil, no matter how amended! It’s in nice gritty soil. 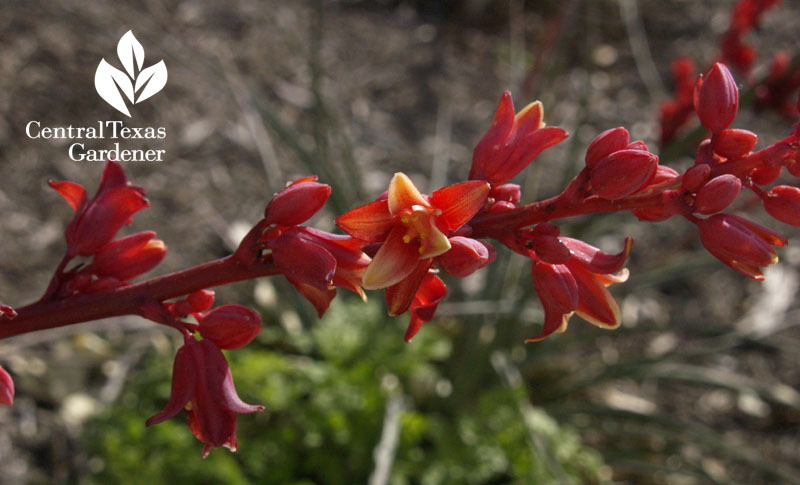 Janet explains: when the bee-loving bracts fade, cut back the gangly stems to the rosettes. 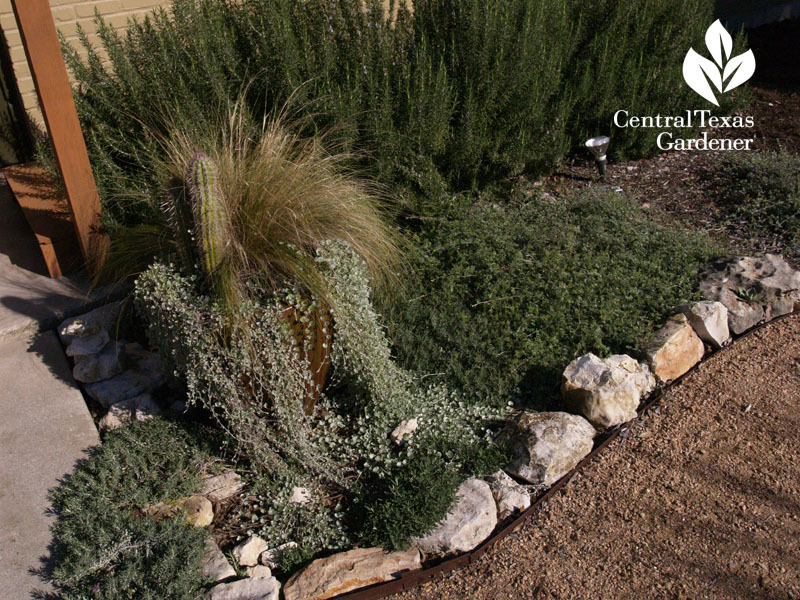 Structural, fragrant rosemary makes a lovely companion to hot, drought designs. 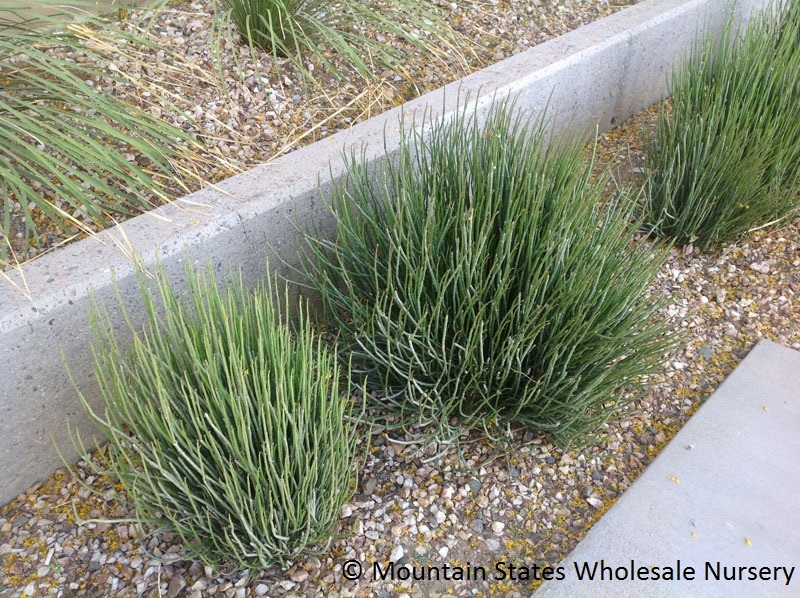 This prostrate variety I planted in my neighbor’s curb bed gets no extra water. 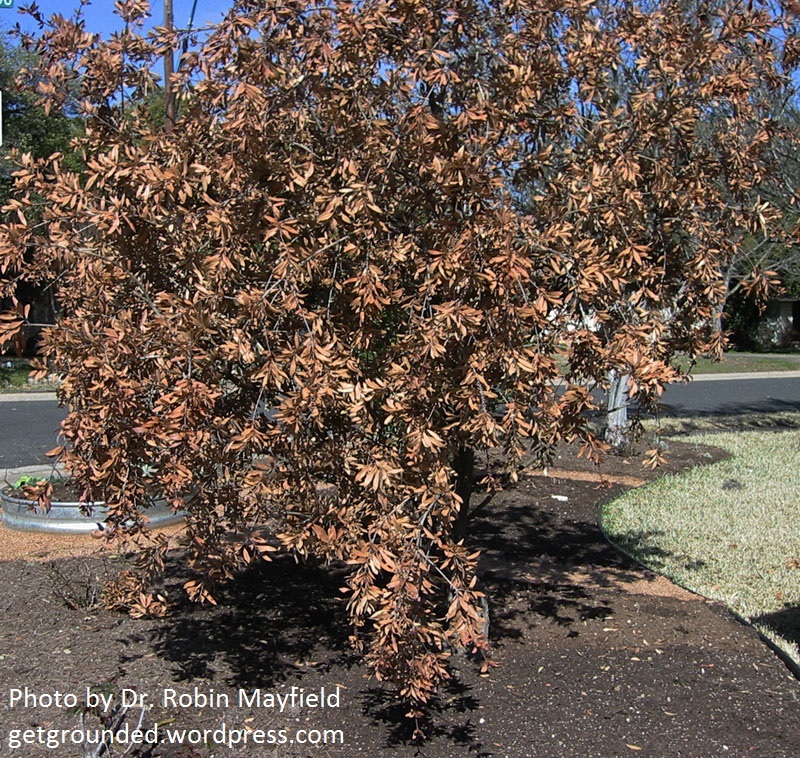 Content, it’s rooting new plants from branches that touch the soil (uh, you know, prostrate!). 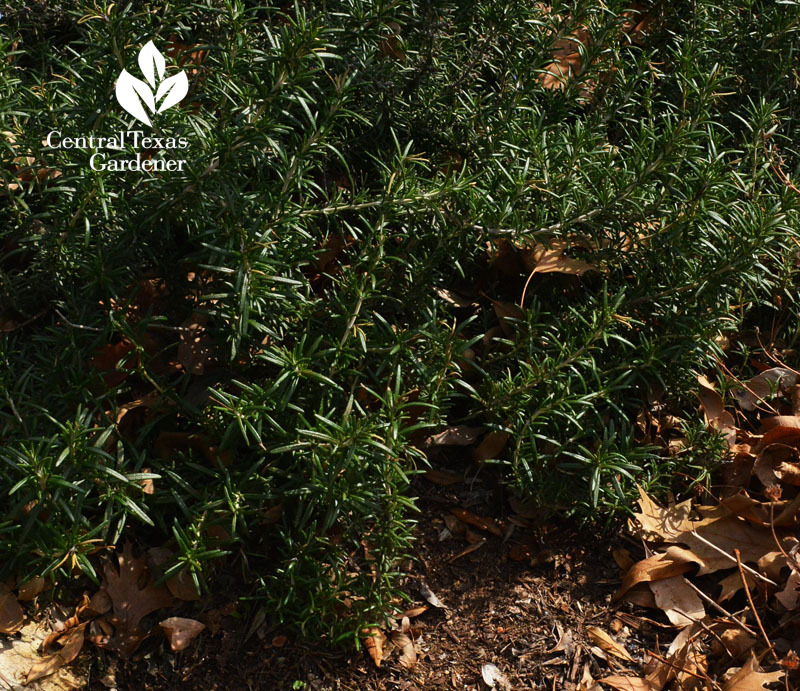 This week, Daphne answers a Facebook question: how to propagate rosemary from stem cuttings. 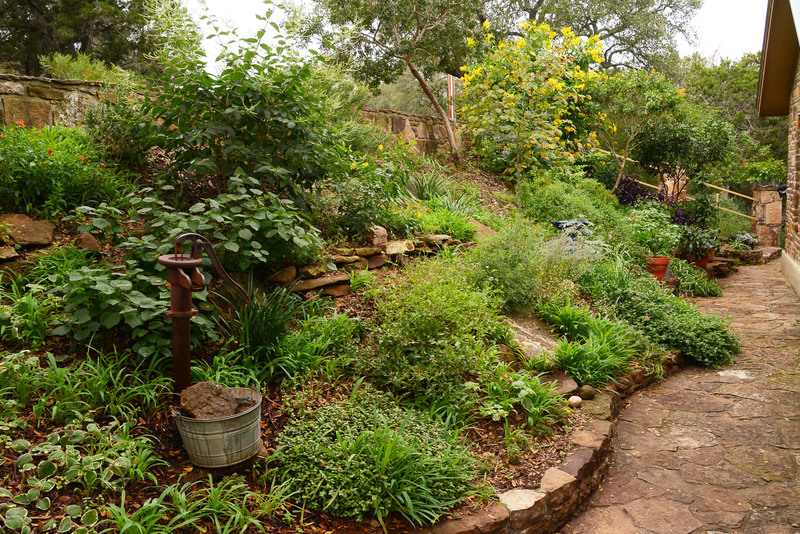 Find out why she recommends rooting in soil rather than in water. 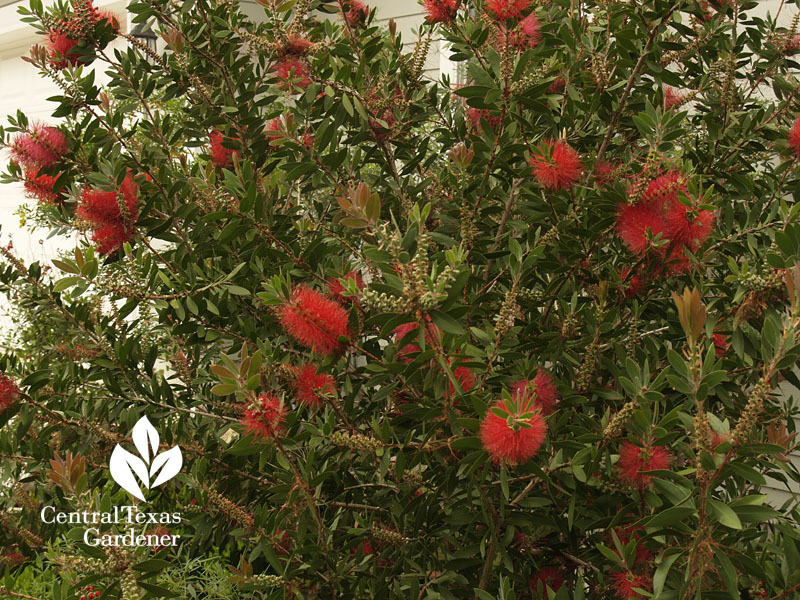 Daphne’s pick of the week is Bottlebrush (Callistemon rigidus), a sure fire bee magnet. This one made it through the freeze in Hutto. 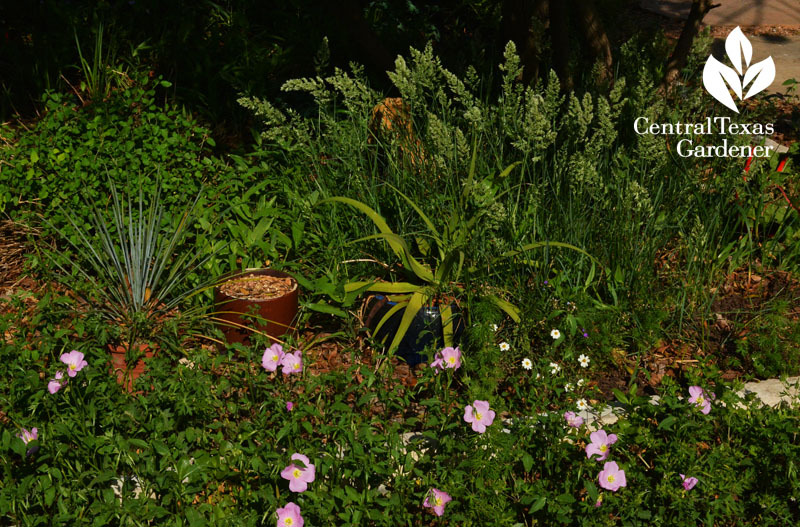 Dr. Robin Mayfield, gardener and blogger at Getting Grounded, absolutely loved hers. Sadly, in her microclimate, super freeze took it out. Still, other gardeners didn’t lose a leaf this winter. And it’s a great evergreen screen, so give it a try if you have a protected spot where it gets sun but not all-day searing blasts. 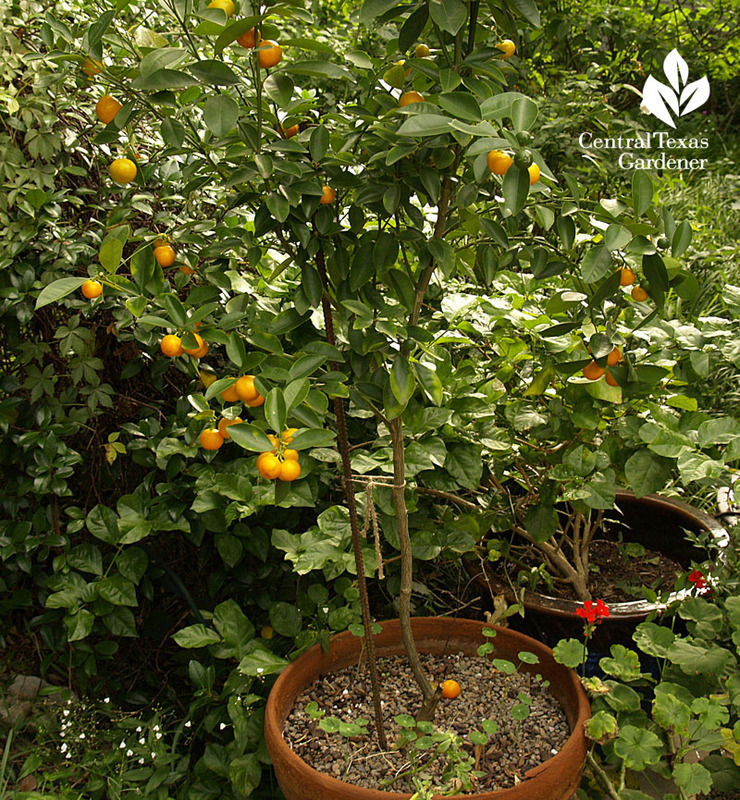 For homegrown fruit even in containers, Trisha shows how to grow yummy kumquat and calamondin. And Kaffir lime, which may not produce fruit, but the leaves are wonderful in Thai and other recipes. Yes, they need some water, but too much is actually worse than not enough. Last year I tried my first calamondin in a pot. I watered it deeply once a week. It got nipped when it hit 12°, but is still alive. Like the kumquat, it flowers and fruits from spring to frost. The fruits are very tart, even when super ripe, but are great in recipes and to munch if you like tart, as I do! 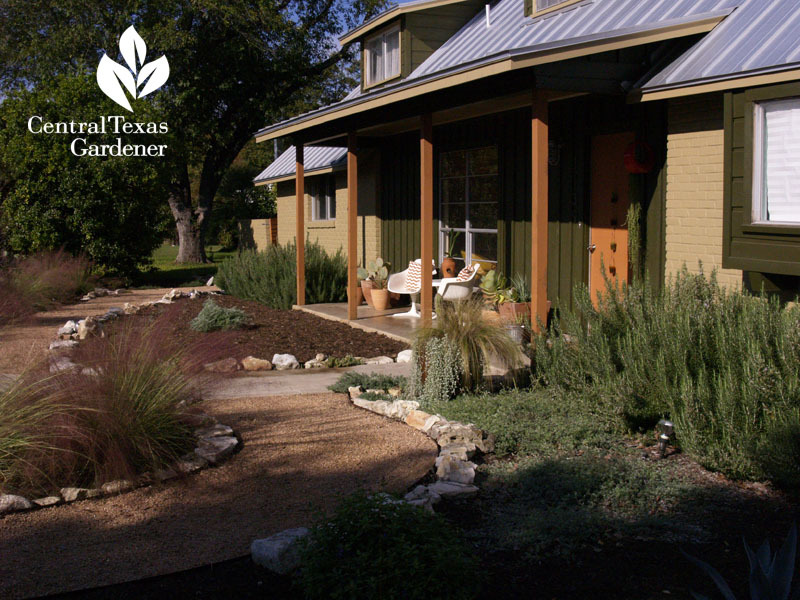 On tour, check out how new Texas gardener and fabulous blogger Heather and Brett Ginsburg dumped their lawn and boring shrubs for a xeric-style party to wow their kids with wildlife discovery. 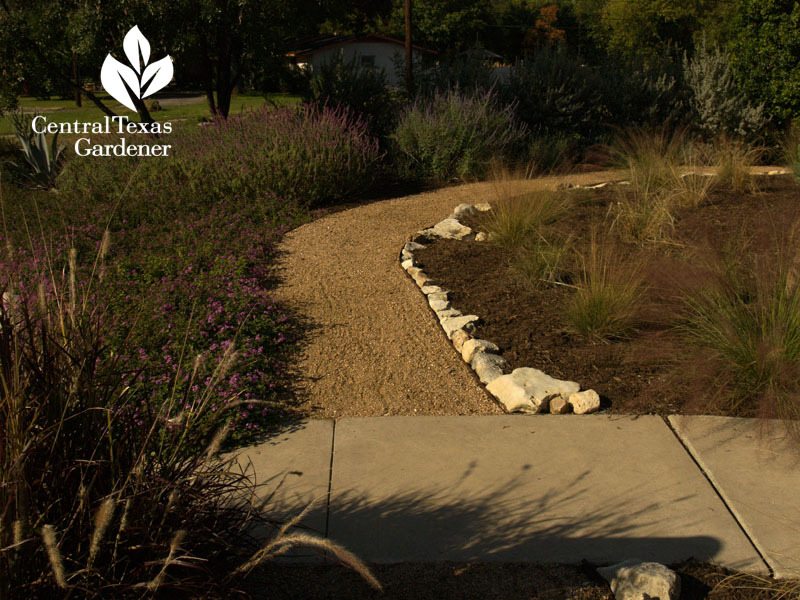 Heather kept an eye on practicality with her design for paths and a screen from a busy street. She also hid the original box store edging with free rocks she scavenged. I really like this combination of rosemary, creeping germander and thyme, with silver ponyfoot (Dichondra argentea) in a pot. In back, she dumped lawn for this fun hangout. 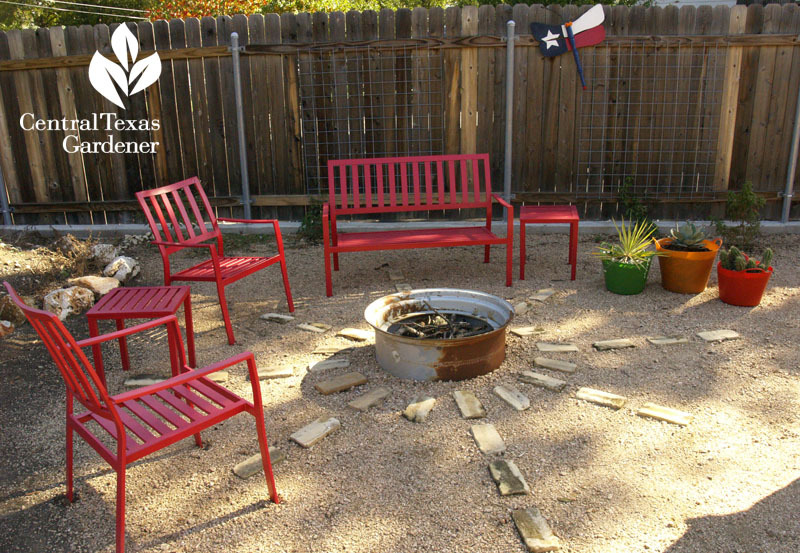 Her fire pit is another scavenge, some big truck tire rim. 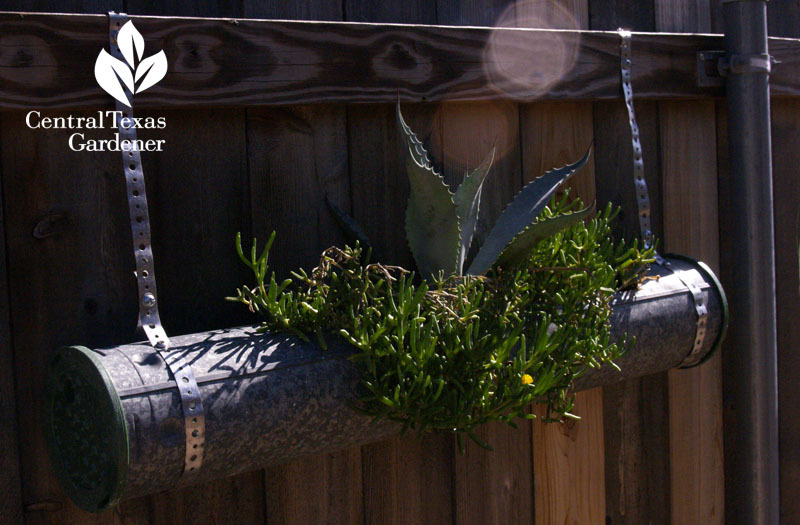 Brett tells us how he turned leftover exhaust pipe into Heather’s succulent planters. And, they dumped lawn in exchange for fresh eggs. They tell their story best, so watch it now! 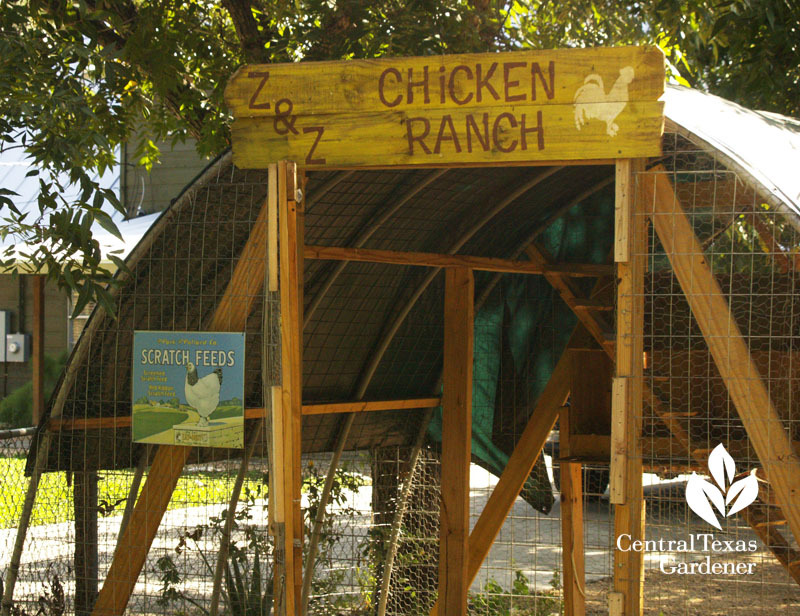 ← Freeze Report|Cold & Deer Proof Succulents|Citrus|Chickens!